Ever thought about taking a last minute offer on an exotic holiday? That’s exactly what my partner and I did last June. Friday afternoon in the local travel agents, Monday flying to the Dominican Republic for nine days at a third of the brochure price. Okay, so we’d looked up the weather on internet and although it didn’t look promising who really wants a whole week of scorching sunshine? Arriving at the banana state like airport the heat and humidity hit us. Quickly transferred to our luxurious beachside resort (hotel complex) at Playa Bavaro, Punta Cana, and shown to our spacious cool air-conditioned bungalow, there was still time to enjoy a sumptuous banquet before downing iced cocktails and retiring for the night. In the Caribbean one tends to wake up at the crack of dawn, very unlike my usual self I must admit. The never ending white sandy beach was as beautiful as I’d expected, emerging from palm groves with fine white sand leading down to an aquamarine, calm warm sea. Unfortunately as soon as I’d slapped the factor 25 suntan lotion on it started to rain. We sheltered under the palm roofed huts which concealed beach bars offering liquid refreshments, iced coco locos, cool lagers and the famous Dominican golden rum with coke. Fresh slivers of coconut were kept moist in glasses of water on the counter and tasted delicious. We thoroughly enjoyed the whole day walking for hours, in the light showers, along that incredible beach, bathing every now and again in the warm Caribbean sea. Walking past other resorts we sat on sun-beds under palm sunshades totally relaxed, reading, listening to the dripping tropical rain. We sauntered back to explore our large hotel complex which had several magnificent pools, a wide variety of restaurants, numerous bars and cocktail lounges, gyms and many other facilities which we were allowed to use free of charge in the fully inclusive holiday. The food was fabulous, a different theme buffet each night, the highlight being the gala dinner with every seafood and roast meat imaginable on display, beautifully cooked and presented. Carved fruits and vegetables, authentic works of art, adorned the dining room and a Merengue trio serenaded us at our table. Our evenings were spent sipping iced daiquiris and watching one of the shows, mainly typical Caribbean dances. One bar and a pizzeria offering free refreshments were open all night. The air-conditioned coach set off early morning for a day trip to Santo Domingo. The journey took us through several small towns the largest of which, Higüey, has a magnificent baseball ground – the Dominicans national sport. The main roads were good but side streets were unpaved. Teenagers in jeans and a MacDonalds burger bar reminded us that youngsters the world over follow the same fashion trends. Small, unhygienic looking, open fronted little food stores lined the streets. The houses in the Dominican Republic are very small and basic so people don’t have to pay taxes on their homes. Approaching the capital city an industrial belt of international companies provides work and prefabricated bungalows or low rise flats for thousands of people. Our first stop was at ‘Los Tres Ojos’- the three eyes. The entrance to the cave is surrounded by a park where the huge red flowering chestnut trees attracted our attention. Steep, ancient twisting steps led down to an underground grotto and three underground freshwater lakes, which give rise to many local superstitions. The Faro de Colon, at the entrance to the capital city is The Colombus Lighthouse, a cross- shaped mausoleum that houses the remains of Christopher Columbus. In 1492 Columbus reached the shores of this, the second largest island in the Caribbean, naming it Isla Epañola or Hispaniola. The Ciudad Colonial (Santo Domingo) became the first European colony in The New World boasting the first forts, churches, cathedral, hospital, monuments and the first university in the Americas. Up to the end of the XVI century the island produced great wealth from mining and sugar plantations. French buccaneers controlled the western part of Isla Española introducing slaves from Africa. The original Taíno Indians, Spanish and French colonisers, and the African slaves’ descendants make up the inhabitants today, a unique race with a mixture of cultures. The Aranjuez treaty, 1777, divided the 77,000 square metres of territory into two nations; French speaking Haiti in the west and the much larger Spanish speaking Dominican Republic. After surviving civil wars, invasions and dictatorships, the country today finally enjoys an established democracy. 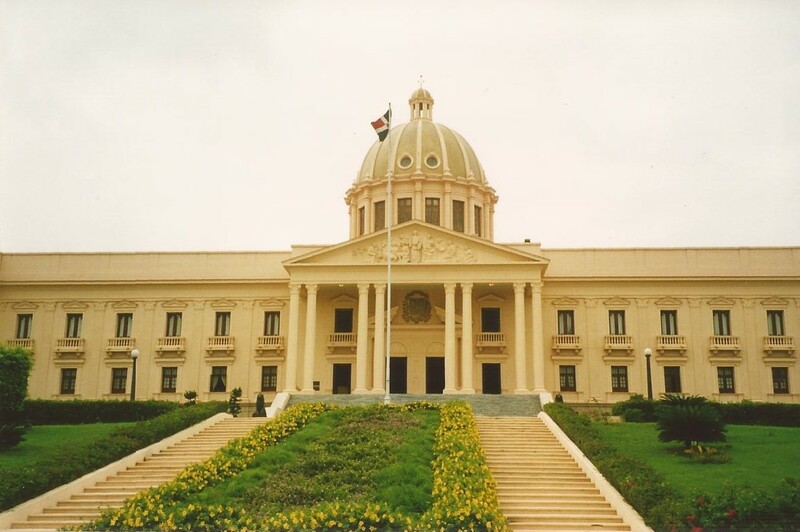 The presidential Palacio Nacional, a replica of the White House, stands proudly over the modern section of the city. The old colonial quarters across the Ozama River retain their peaceful, cobbled, tree lined avenues. The guide showed us round the Pantéon Nacional, museums, along the cafe lined Calle de las Damas to the Catedral Santa María La Menor in Colon square. After lunching in a magnificent seafront hotel, near the busy port, we wandered around a typical bazaar bartering as hard as we could to bring home some fabulous gifts. We came away with two hand painted colourful paintings, taina pottery, a chestnut-wood dolphin and a large tom tom drum. The Bavaro Runners day long ‘safari’ trip was another experience altogether. We had an English speaking guide in our jeep, Kevin, who was very friendly and always joking, a trait of the laid back Dominican people. The jeeps took us out into the countryside, first to a sugar cane plantation. A straight dirt track cut through a sea of endless sugar canes. Tiny ragged, dark-skinned children ran out of small shacks jabbering in a strange language that turned out to be Creole. The sugar plantation workers are brought down from Haiti with their families from December to July for the harvest. It seems a hard life, the men and boys cutting the cane by hand with evil looking scythes, tilling the ground with oxen as they have done for centuries. The cane was originally brought from India to the Dominican Republic in the 17th century by Columbus on his second journey. Stopping to taste the cane the whole process was explained. First squeezed through presses where brown molasses are formed, chemicals are then added to obtain white sugar; fertilizer, paper and plastics are also produced. The world famous Dominican golden rum is distilled from the molasses, 78 per cent of which is exported to the USA along with 50 per cent of the sugar. The next stop was a cigar museum where we were shown how a cigar is made. The genuine cigar is rolled up from two tobacco leaves and wrapped by a third; beware of banana leaf substitutes! The tobacco plants are actually grown in the north of the island due to the climate. Driving along rough roads into the low mountains small villages small, brightly painted houses came into sight. Pretty children smiled and waved to us along the way. Each village has a yellow painted school as the government are ensuring education in rural areas of the country. In the entire country 50 per cent of the eight million population are under the age of 15. We were shown round a village home; the rooms were tiny, but at least had electricity, the owners being extremely proud of their small television set. Constructed from Royal Palm, wooden buildings last for around 80 years and are painted, by tradition, at the end of every year. From the plots at the back of their houses villagers apparently make their meagre living by selling produce from the incredible variety of fruit grown here. They had every kind of fruit tree or plant imaginable in their back gardens; mango, avocado, grapefruit, banana, pineapple, coconut, coffee bean, cocoa, passion fruit, lime, sweet lemon, the vine like vanilla plant which creeps up larger trees, to name only a few. The jeeps took us further into La Altagracia Mountains passing through beautiful scenery, tropically green with exotic shady trees, and according to the guide there are over 5,600 different species. Heading for the ranch a river came into sight with horses grazing in the open meadows. Before lunch there was optional horse riding which was fun. Sitting on wooden benches everyone helped themselves to a traditional Dominican style buffet. I ate a mild sort of chilli con carne with rice, sweet potatoes and fried plantains followed by fruit. Back into the jeeps and not far away were dream like deserted beaches where we spent the afternoon swimming in the crystalline waters. 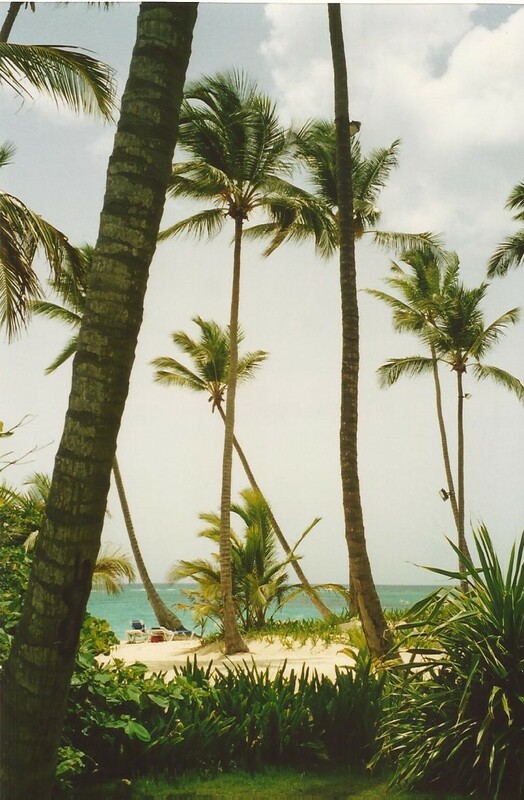 The distinctive very tall Cana coconut palm which grows along the beaches here gives its name to the whole Punto Cana area. The weather on the whole was beautiful and our days left were spent lazily in our fabulous five- star complex at Playa Bávaro, walking, swimming and kayaking. The kayaks are similar to canoes and we loved whizzing along the coastline and out to the coral reefs. Trips are organised for the scuba diving which is meant to be good here. All non-engine water sports, including wind surfing, kayaks, catamarans etc. were free of charge. A cluster of colourful ethnic gift shops were just round the corner beside the shore, but a lot of hard bargaining was needed and the gifts were dearer than in the city! 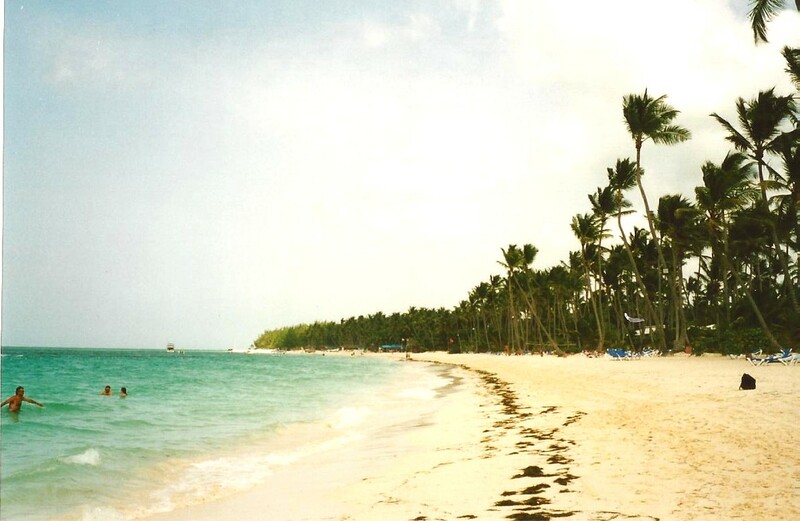 The week sped past and it was soon time to be taken back to Punta Cana International Airport. The custom officers looked very hard at my partner before letting us through, after all he looked extremely dark by the end of our stay! Even my lilywhite skin had a golden tan by the end of our fabulous holiday. It sometimes takes a little courage to travel to an unusual country, and Jamaica is definitely ‘different’, but don’t be afraid to go out, be open to other cultures, other people, other food, different climates as there is so much to discover. 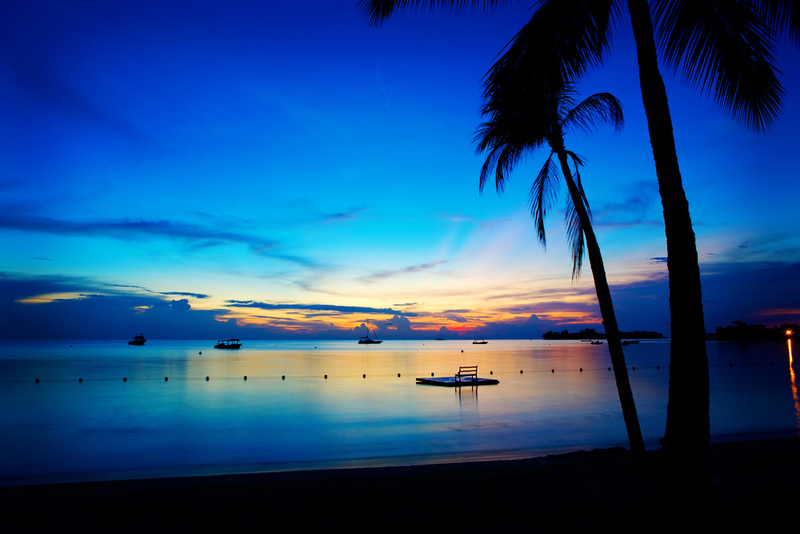 Jamaica is a beautiful Caribbean island with stunning beaches that will captivate you the moment you step onto the sands. Negril was originally a haven for hippies in the 60s and the main stretch has maintained its cool, laid-back, carefree atmosphere, perfect for a relaxing beach holiday. An incredible 19 miles of powdery white sands glisten under the sun and gently curve to meet the dramatic West End Cliffs, Bloody Bay and Half Moon Beach. What’s usually incorrectly called Negril’s seven-mile beach is really only the lively middle stretch of Long Bay Beach where you’ll find restaurants, bars and hotels. Jam the night away with live Reggae every night at the beach. A spit of land marks the end of Long Bay and the beginning of Bloody Bay, so named because hunters used to massacre whales there, turning the sea blood-red. Once a secret, secluded spot, today it is a little less private, though fortunately it is no less beautiful and still boasts pristine white sands and turquoise waters. If you want to get away from the crowds, Bloody Bay is the perfect peaceful retreat. I was fortunate enough to be staying in an all-inclusive ocean-front hotel at Bloody Bay. The colonial style hotel had beautifully appointed spacious rooms, fabulous pool area, choice of dining-rooms, several bars and cocktails lounges to sip long cool tropical drinks and acres of garden skirting the pale, sandy beach shaded by palms. The calm, shallow Caribbean waters offer a cooling break from the sun or a perfect place to test out all sorts of water sports, from snorkelling and kayaking to jet-skiing and catamaran sailing. The in-hotel morning activities included aerobics in the sea, reggae lessons on the sands, beach volleyball and other sporting activities. All non-motor water sports were free for guests. The evening entertainment was…entertaining! There were Reggae nights with a live group playing, beach parties and shows with different themes each evening to enjoy under the starlit sky. The young Jamaican entertainment team were very friendly, professional and amusing. Humming birds flit through the tropical trees in Negril and as darkness falls a fascinating ringing fills the air, a sound made by almost invisible tiny Treefrogs hidden among the foliage. Late afternoon the golden sun sets the sky ablaze in a breathtaking display of tropical hues. The atmosphere in Jamaica is so totally laid back that it’s quite amusing. Outside the hotel complex you’ll probably be offered ‘grass’ at every turn, but embarrassing as this might be just say no thanks I don’t smoke and there’s no hassle. It is in fact highly illegal but from the silly smiles and pungent smell a lot of locals must while the days away in a dream world. On the whole the people are dreadfully poor but seem much happier than the rest of over-stressed civilisation. Be ‘Negrilized’ and have your hair plaited, tipped with beads or shells for a true island look. Although the warm and friendly Jamaicans speak English, between themselves they use an unintelligible local Jamaican Patois. Just say “Cool Mon” and “No Problem”, switch your phone off, relax and you’ll feel a different person at the end of your stay. Romance flourishes in ‘One Love paradise’ and from our balcony window we could see wedding celebrations on the lawns. Couples can be married just 24 hour after arriving in Jamaica providing prior application has been made for a marriage license. Some hotels will make all arrangements for you and special package prices can include the ceremony, flights plus any other special requests. It’s been said that the soul of Jamaica is its people, heritage and reggae music while the heart of the island is her rivers and mountains, laden with tropical flora and fauna. Trips can be expensive but you just must see some of the country. Take an excursion to the typical market town of Lucea or discover the unexploited southern coast and take a boat safari into the swamps to see crocodiles and exotic birds in their natural habitat. Mayfield Falls caters to those who want to travel off the beaten track to discover the real treasures of Jamaica. Two majestic crystal clear waterfalls, 21 natural pools, the lush vegetation and cool waters are home to 52 varieties of ferns, wildlife, wildflowers and different species of birds. Unfortunately Jamaica’s capital city, Kingston, was too far away across arduous roads from our part of the island for a day trip, although I would have loved to visit one of the main attractions, the Bob Marley museum. On an absolutely unforgettable day my partner and I took a coach excursion along the north coastal road, with spectacular views of the sparkling Caribbean Sea on one side and densely wooded hills on the other. We passed through several small towns and villages with such evocative names as Montego Bay, Priory, Runaway Bay, Seville and Discovery Bay before we reached Dunn’s River Falls. Originally called “Las Chorreras” during the Spanish rule, the name has degenerated over the centuries to “Ocho Rios”, although there are actually only four rivers in the area – Cave River, Roaring River, Turtle River and Dunns River. The springs are characterised by an unending flow of crystal clear water, punctuated by rapid cascades and waterfalls which pour directly into the Caribbean Sea. A stone’s throw from Ocho Ríos, one of Jamaica’s fastest growing resort centres, Dunn’s River Falls is unique and its location by the sea gives the distinction of being the only one of its kind in the Caribbean, if not the world. We literally climbed up the falls in a human chain led by experienced Falls Guides, pausing in a rock pool and experience the soothing effects of the water as it cascades to the sea. It’s an unforgettable experience and a must for your holiday itinerary. Rafting is one of the rare pleasures which you can enjoy during your visit to Jamaica, and the trip on the picturesque Martha Brae River is given added spice by the legend attached to the river. The river is named after an Arawak Indian girl who had supernatural powers, a member of the tribe of Indians who were Jamaica’s first known inhabitants and who called the island, Xaymaca, land of wood and water. We glided gently downstream aboard a 30 foot, two-seater bamboo raft, guided by a local man called Gayley. He handed us a hand-carved gift and we were glad to give him a decent tip as this was probably the only income he’d have in a while to support his family in the mountains. The 90 minute raft ride was a beautiful experience as we passed between the lush green river banks adorned with gnarled ancient trees. 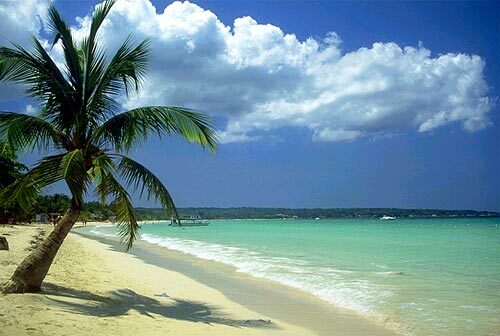 Jamaica, the third largest island in the Caribbean, is 235 kilometres long and 93 kilometres at the widest point. Fewer than three million people live on the island, mostly in Kingston and Montego Bay. A land of mountains, plateaux and plains, dominated by a series of mountain ranges that run across the centre of the island- the highest point, the Blue Mountains is area famous for producing the best coffee in the world. Many of Jamaica’s 120 rivers originate in these highlands, watering the land on their way to the Caribbean Sea. There are 1,022 kilometres of coastline; reef-protected white sand beaches characterise the north, while the coastline of the south has predominantly black sand beaches. At approximately 18 degrees north of the equator, the island falls within the tropics and averages 12 hours of sunlight per day – always enough time to do everything, or never enough for anything!